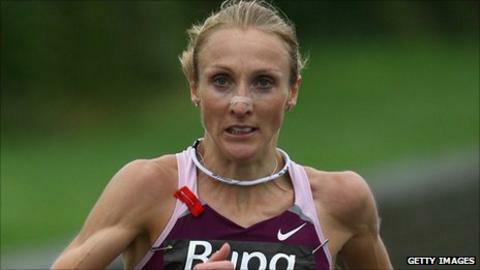 England's Paula Radcliffe believes new rules which mean her world record marathon time will no longer be classed as such are "unfair". The new criteria made by the sports governing body, the IAAF, states that only times from all-female competitions will be acknowledged as records. Performances in mixed conditions will be referred to as "world-best" times. This means Radcliffe's 2003 London time of two hours 15 minutes 25 seconds is no longer a women's world record. Radcliffe, whose time of 2:17:42 in London is now the world record time, told Runner's World: "I think it is a decision that is going to be hard to fully enforce. Look at how many national and area records are set in mixed races. "I also think it is a little unfair. If they were going to make that rule, it should have been so from the beginning when world records came in on the roads. Now it is messy. "In my two mixed races it was not my decision to have male runners with me, but that of the race organisers, and in each case I very consciously ran alongside them rather than ever behind. "Indeed, in London, I was actively racing the two guys. "Furthermore, I fully believe that I would have run pretty much the same time that day alone. However, rules are rules and I can't stress about things that are out of my control." World Major Marathons (WMM) and the Association of International Marathons (AIMS) also called the rule change "unfair" while BBC Sport understands that London Marathon race director Dave Bedford will discuss the issue at the next IAAF conference. A statement from WMM and AIMS said: "[We] have reviewed the recent congress decision and believe that it does not represent what is required by the sport of road running." It added that the organisations will acknowledge both types of performances as world records before discussing the matter with the IAAF, the sport's governing body. The statement continued: "The vast majority of women's road races throughout the world are held in mixed conditions. "The current situation where the fastest time is not now recognised as a record is confusing and unfair and does not respect the history of our sport." AIMS represents more than 300 races worldwide, the vast majority of them road races. Boston, London, Berlin, Chicago and New York are WMM members.